Climate Time Series Analysis: Classical Statistical and Bootstrap Methods 2010 ed. This book is written for climatologists and applied statisticians. It explains step by step the bootstrap algorithms (including novel adaptions) and methods for confidence interval construction. It tests the accuracy of the algorithms by means of Monte Carlo experiments. It analyses a large array of climate time series, giving a detailed account on the data and the associated climatological questions. This makes the book self-contained for graduate students and researchers. 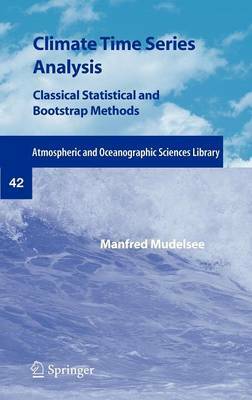 This book presents bootstrap resampling as a computationally intensive method able to meet the challenges posed by the complexities of analysing climate data. It shows how the bootstrap performs reliably in the most important statistical estimation techniques. Fundamental Concepts.- Persistence Models.- Bootstrap Confidence Intervals.- Univariate Time Series.- Regression I.- Spectral Analysis.- Extreme Value Time Series.- Bivariate Time Series.- Correlation.- Regression II.- Outlook.- Future Directions. Manfred Mudelsee received his diploma in Physics from the University of Heidelberg and his doctoral degree in Geology from the University of Kiel. He was then postdoc in Statistics at the University of Kent at Canterbury, research scientist in Meteorology at the University of Leipzig and visiting scholar in Earth Sciences at Boston University; currently he does climate research at the Alfred Wegener Institute for Polar and Marine Research, Bremerhaven. His science focuses on climate extremes, time series analysis and mathematical simulation methods. He has authored over 50 peer-reviewed articles. In his 2003 Nature paper, Mudelsee introduced the bootstrap method to flood risk analysis. In 2005, he founded the company Climate Risk Analysis.